Contact us to make reservations, book exclusive travel packages or learn about the exciting attractions and dining just steps away. We look forward to hearing from you! Front view of the Prince Albert Guest House Bed and BreakfastOur Expanded Continental Breakfast is offered between 8:30AM- 10:30AM offering Starbucks Coffee and Nespresso®, a selection of teas, fresh orange juice, fresh fruits (seasonally) include strawberries, blueberries, cantaloupe, yogurt, granola, cereals, fresh baked muffins, bagels, cream cheese and featuring deep pocket Belgian Waffles and more... Kings & Queens love our spread! You are welcome to enjoy it in any of the common areas or on the front or rear patios. We want everyone to fully enjoy their stay so please keep your voice level and that of electronic devices at a low level to ensure they are appropriate for the time of day or night and for your location. Glass is not allowed on the front or back patios; we'll provide plastic cups as alternative. The property is adults only. No guest under the age of 18 are allowed. 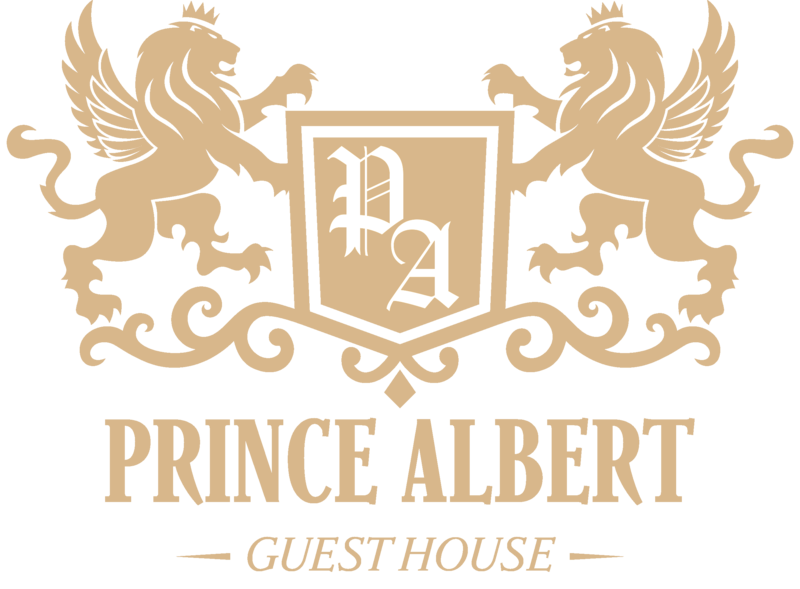 Rates are based on up to two person occupancy with only one bed in each room (Queen or King). Pets are not allowed without the express consent of management prior to your stay and this must be acknowledged in your reservation. If approved, you will be assessed a $35/day fee which is in addition to the daily room rate; damage in excess of that amount is your full responsibility & will be billed to your credit card. Read/Print our Pet Policy Addendum. Please bring any issues of cleaning necessity to the Attention of the Innkeeper at once so that we can happily accommodate you. You are never an imposition as our guest.... let us know what you need! We offer private self parking at $10 to $20/night ($$ is subject to change depending on the season) in our private parking lot on next block; we have unloading zones in front of the Guest House between Winthrop St. and Central St. If you choose to drive you will pull up to our inn first to get checked in and unload your luggage; we will give you a parking placard/map with your assigned spot #. We consider Provincetown, and our parking facilities, to be very safe but we are not responsible for damage of any kind to you, your vehicle or your property. This is a privately owned property and management reserves the right to refuse service to anyone; guests are subject to the guidelines set forth by management to ensure everyone is able to enjoy their stay with us (see cancellation policy). Minimum lengths of stay requirements may be applicable (you'll be notified after online request or you can call on us prior to reservation for clarification). You are encouraged to buy Trip Insurance to protect the investment in your trip which should include the full cost of your stay with us and your transportation into and out of Provincetown (flight, car, etc). The decision to buy insurance, and from whom, is your choice but one of the insurance carriers you can contact is: Allianz at (800) 284-8300 or online at: www.allianztravelinsurance.com. Cancellations with more than 21 days notice will receive their full deposit back. Cancellations with 21 days or less notice will not be refunded and the entire cost of the stay may be assessed*. We may at our discretion, offer a Guest House future "courtesy stay" (valid until the end of the current calendar year). There are no refunds for shortened stays or for early departures, whether we ask you to depart or whether you choose to depart early (trip insurance recommended as noted above). Second time cancellations of rescheduled stays will forfeit their monies paid or "courtesy stay" value up to full cost of stay based on date of cancellation as noted above. *All holiday and special events are non-refundable which includes but is not limited to: Memorial Day, July 4th Week, Bear Week, Carnival Week, Labor Day & New Year's Weekend). Check-In: After 2:30PM until 5:00PM (after 5PM may require late check in so please advise in advance and as early on day of travel as possible if you get delayed! Check-Out: By 11:00AM (if parked we ask to move your car by 10:45). Late Check In: After 5:00 PM - Please contact in advance if you are arriving after 5:00PM as soon as possible on your arrival date so that we can advise you on the Late Check-In Procedure! We look forward to your visit and want you to know that we will do everything possible to make your stay pleasant and enjoyable. If you desire any special items such as flowers or champagne in your room upon arrival, we request that you notify us at least one week in advance, if possible. Provincetown is a walking and biking town so we encourage you to travel without your car by choosing to come via Fast Ferry or via Cape Air out of Boston Logan Airport). We have limited parking at a private lot around the corner so YOU MUST REQUEST A PARKING SPOT IN ADVANCE if needed. We find our parking arrangement to be superior to many properties because you keep your keys and come/go as need vs. other properties that have tandem parking which requires staff to keep your keys as they are likely to move your car throughout each day. Upon pulling up to our property there is 15 Min Unloading Zone between Joe's Coffee (corner of Winthrop/Commercial) and The Prince Albert (corner of Central/Commercial). Turn on your flashers and bring your luggage inside the to get registered/checked-in. Children are not allowed. Pets are welcome. Pets must be approved by the innkeeper before you reserve. Please contact the inn directly to obtain approval. A pet fee of $35 per day will be added to the reservation. Only certain rooms are able to accommodate pets. We only accept well behaved dogs.